In 2013, the Oregon legislature passed several measures designed to strengthen career and technical education. The most successful endeavor required collaboration among the Department of Education, the Bureau of Labor and Industries and the Department of Community Colleges and Workforce Development. These three institutions work together to ensure that the curriculum offered by vocational and trade schools in Oregon are skills that will be used on-the-job. The new laws increased the funding for vocational and trade education, including the $7.5 million Career and Technical Education Revitalization Grant. This page outlines what vocational students can study in Oregon and what jobs may be available to them after graduation. 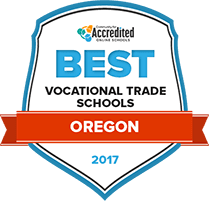 Students interested in attending any of Oregon's trade and vocational schools can benefit from a look at these rankings. Here they will find many vocational and career colleges, as well as community colleges that can teach students the skills to enter fast-growing industries, such as construction and manufacturing. These Oregon schools are accredited, offer placement services for grads and are ranked by criteria that includes tuition, financial aid options and length of programs offered. Lane Community College has several two-year degrees across several categories, like advanced technology, business and health professions. There is also a professional and technical careers category for people looking for traditional vocational programs. There are over 40 career programs at the school. There is also a way to browse programs by career if a prospective student is still uncertain of what they would like to do. It’s a matter of looking through a list of careers and seeing what is appealing. Once a two-year program is chosen, in many programs, students take pre requisites like business proofreading and editing, move on to general education and then take career-specific courses. Mt Hood Community College offers many two-year programs under their career and technical program category. Program topics run the gamut, from automotive technology to child development & early education to integrated metals to national resources technology: wildlife resources. Students typically start courses related to their chosen career path in the first semester of the program, with a few general education requirements throughout the program. The program operates in fall, winter and spring “quarters,” during which students take about 13 to 17 credit hours per quarter. Rogue Community College focuses on comprehensive two-year college programs. The school offers several associate in applied science degrees that get students working right out of their two-year degree. Some of the more unique programs include fire science and diesel technology. There are also more traditional programs like nursing and business technology. The business technology program allows students to focus on accounting, management or marketing. There is also a computer support technician program that allows students to focus on health care informatics. Many programs require a few general education prerequisites, core program requirements and several electives. Some have additional courses for certain career focus options, like accounting. Linn-Benton Community College offers a host of two-year degree programs that allow students to enter the workforce right after that degree. Students will want to look for associate degrees within their chosen career interest. The programs are arranged into several categories like business, industrial and computers. From there a host of topics is offered, from accounting technology to CNC machinist. Many will specify if they are geared toward transferring to a four-year institution or not. Students will be prepared to sit for any licensing exams that their career may require, as well. At Chemeketa Community College, programs that set students on the road to a career after their education fall into their Career Pathways roadmaps. These show students what coursework, skills, credits and competencies they’ll need along the way of their program to obtain their chosen career. Many of these programs are indeed two-year degrees, though some are only certificates. Students of these two-year programs typically start courses related to their career path within the first semester of the program, and a few general education requirements are spaced throughout the program, many of which are electives. At Umpqua Community College, students who want a technical career education will need to enroll in the associate of applied science (AAS) degree. There are several AAS degrees offered across different categories like arts & communication, business & management, computer, education, engineering technology, health services, human service & public safety, industrial, transportation and viticulture & enology. Students typically start with core programs related to the career in their first semester of the program. The programs also typically include a few general education requirements, along with a few elective courses. Central Oregon Community College breaks its program down into two categories: those offering a career and technical education (CTE) and degrees for people who are looking for transfer preparation into a four-year college. Those looking for a more vocational track will want to look for associate degree CTE programs. The school offers many specialized technical programs, like aviation professional pilot- airplane, baking & pastry arts and veterinary technician. CTE programs typically focus on core courses for the chosen career right in semester one, with a couple general education courses. Many programs also have courses in specialized topics. Portland Community College offers many programs that will help students attain a career right after their two-year degree. Students will want to look for associate of applied science degrees under their career interests if they wish to attain a two-year degree that transfers directly into a career path. The two-year programs are unique in that they allow some of the courses in the program to meet general education requirements. For instance, Computer Drafting for Interior Designers meets the general education math competency requirement for those studying interior design. Earning an associate of applied science degree at Southwestern Oregon Community College means a student will have a head start on starting the career they’ve been working towards. Specialized learning provided in these programs includes comprehensive general education and hands-on practical learning specific to a student’s field of interest. Students who have previously taken classes at another institution of higher education may be able to satisfy some of their degree requirements with transfer credit. Students will also be able to benefit from advising services, career counseling, and peer tutoring to make the most of their college experience. The path to a well-paying career starts with earning a degree from an institution of higher education. That’s why Columbia Gorge Community College offers specialized two-year associate of applied science degrees that lead to direct induction into the workforce. Through these programs, students will make connections with individuals who have years of experience in their respective fields. Students also have the opportunity to complete many of their courses online, providing the flexibility that is often required to succeed in a college environment. Career advisors are also available to set up mock interviews and review resumes, helping to assure students that they will be able to meet their goals after graduation. Vocational and trade schools in Oregon focus on six broad areas: arts, information and communications, industrial and engineering systems, agriculture, food and natural resource systems, health services, human resources and business management. Students can earn their vocational educations at community colleges, technical schools, comprehensive high schools and adult learning centers. Use the search tool below to find the Oregon vocational and trade schools that best match your career goals. At the post-secondary level, women outnumbered men in vocational programs with 33,744 women and 32,083 men enrolled. Oregon has 301 public schools that offer vocational education and in 2013, 82 percent of vocational school students graduated from high school. Redmond High School received a $474,955 state grant to add more STEM and manufacturing courses to its manufacturing technology program. This expansion was in response to Redmond Economic Development, Inc.’s analysis, which found that the local labor market demands this kind of training. 94 percent of Oregon’s CTE students met the state’s goals for reading and language arts skills during the 2012-2013 school year. By 2025, Oregon is aiming for 40 percent of all Oregon residents to have at least an associate degree or some professional credential past high school. Oregon has created numerous programs that make it easier for students to earn career certificates degrees. One of the most successful programs in Oregon is the Expanded Options Program, which allows students in the eleventh and twelfth grades to earn dual high school and college credits. This has been boosting the state’s number of students earning one-year certificates and associate degrees, which now land close to the national averages. With almost 2,000 companies employing over 50,000 workers, Oregon’s information technology industry is thriving. Research and development from Intel and combined with Oregon’s culture encouraging creativity and innovation have contributed to the rapid growth in this industry. This spells opportunity for vocational school graduates who specialized in information technology, computer science or related fields. For example, the computer user support specialist profession, one of the fastest growing industries in Oregon, is projected to see 9,650 more jobs, or a 24 percent increase by 2022. As mentioned earlier, education and health science fields are amongst the most popular programs for vocational students in Oregon, and are also two sectors with significant projected growth. In other words, employment prospects for the many Oregon students earning their credentials in these subjects are expected to remain bright. The table below includes information on the professions for candidates with some college education and associate degrees seeing rapid growth in Oregon, along with the median wage for each position at the state and national levels. The Greater Portland region has seven key business sectors presenting opportunities for vocational and trade school graduates. The metals and machinery sector made up of Schnitzer Steel Industries, Precision Castparts and ESCO is one of the largest industries in Oregon. Since employment in Portland’s metals and machinery industry is twice the national average, it is the perfect location for those who attend Portland Community College to find work after graduation. The school offers programs such as diesel mechanics technology, industrial mechanics and maintenance technology and aircraft maintenance technology. Another fast-growing industry in Portland is computer and electronics, which employs 32,000 of the city’s workers. Vocational school students can prepare for jobs in this area by enrolling in computer and information sciences and support services programs at schools like Heald College-Portland and Everest College-Portland. Includes information on the state’s career and technology education clusters, specific programs and the initiatives that Oregon has created to support CTE. This CTE-dedicated YouTube channel provides videos from the Oregon Department of Education. Topics covered include CTE policies, technologies and programs. Sponsored by The Oregonian, this is an online database for job search in Portland and the state. The agency’s website includes information on wage laws, employment statistics and vocational training in the state. In addition to a job search database, Workforce Oregon provides education and training resources by subject: healthcare, STEM, green jobs, and diverse groups.